The arrangement of a LED Seven Segment Display is shown in Fig. 20-6(a). The actual LED devices are very small, so, to enlarge the lighted surface, solid plastic light pipes are often employed, as shown. Any desired numeral from 0 to 9 can be indicated by passing current through the appropriate segments, [Fig 20-6(b)]. Part (c) in Fig. 20-6 shows three LED Seven Segment Display together with a two-segment display referred to as a half digit. The whole display, termed a three-and-a-half digit display, can be used to indicate numerical values up to a maximum of 1999. The LED Seven Segment Display may be connected in common-anode or in common-cathode configuration, [Fig. 20-6(d)]. When selecting a LED seven-segment display, it is important to determine which of the two connecting arrangements is required. The relatively large amounts of current consumed by LED seven-segment displays are their major disadvantage. Apart from this, LEDs have the advantage of long life and ruggedness. Liquid crystal material is a liquid that exhibits some of the properties of a solid. The molecules in ordinary liquids normally have random orientations. In liquid crystals the molecules are oriented in a definite crystal pattern. 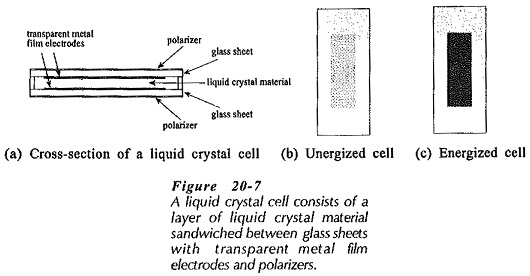 A liquid crystal cell consists of a very thin layer of liquid crystal material sandwiched between glass sheets, as illustrated in Fig. 20-7(a). The glass sheets have transparent metal film electrodes deposited on the inside surfaces. In the commonly used twisted nematic cell two thin polarizing optical filters are placed at the surface of each glass sheet. The liquid-crystal material employed twists the light passing through when the cell is not energized. This twisting allows the light to pass through the polarizing filters, so that the cell is semi-transparent. When energized, the liquid molecules are reoriented so that no twisting occurs, and no light can pass through. Thus, the energized cell can appear dark against a bright background. The cells can also be manufactured to appear bright against a dark background. Seven-segment numerical (and other type) displays made from liquid crystal cells are referred to as liquid crystal displays (LCDs). Two types of LCDs are illustrated in Fig. 20-8. The reflective-type shown in Fig. 20-8(a) relies on reflected light. The cell is placed on a reflective surface, so that when not energized it is just as reflective as the surrounding material, consequently, it disappears. When energized, no light is reflected from the cell, and it appears dark against the bright background. The transmittive cell in Fig. 20­-8(b) allows light to pass through from the back of the cell when not energized. When energized, the light is blocked, and here again the cell appears dark against a bright background. 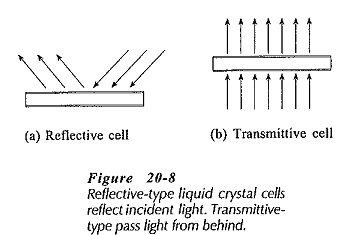 The trans-reflective cell is a combination of transmittive and reflective types. Because liquid-crystal cells are light reflectors or transmitters rather than light generators, they consume very small quantities of energy. The only energy required by the cell is that needed to activate the liquid crystal. The total current flow through four small LED Seven Segment Display is typically about 20 μA. However, LCDs require an ac voltage supply, either in the form of a sine wave or a square wave. This is because a continuous direct current flow produces a plating of the cell electrodes that could damage the device. Repeatedly reversing the current avoids this problem. A typical LCD supply is a 3 V to 8 V peak-to-peak square wave with a frequency of 60 Hz. Figure 20-9 illustrates the square wave drive method. The back plane, which is common to all of the cells, is supplied with a square wave, (with peak voltage VP). Similar square wave applied to each of the other terminals are either in phase or in antiphase with the back plane square wave. Those cells with waveforms in phase with the back plane waveform (cells e and f in Figure 20-9) have no voltage developed across them. Both terminals of the segment are at the same potential, so they are not energized. 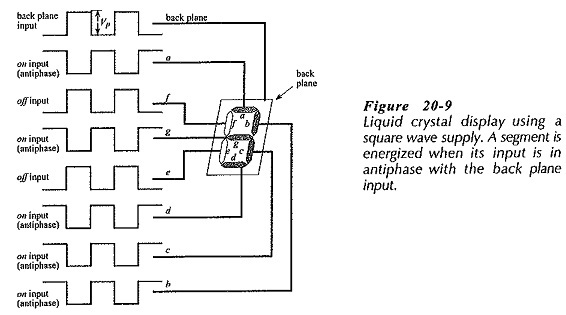 The cells with square waves in antiphase with the back plane input have a square wave with peak voltage 2VP developed across them, consequently, they are energized.